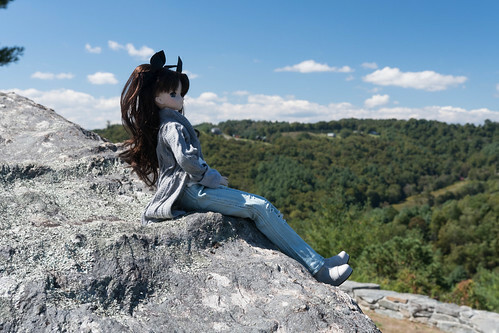 Where it all began: Tohsaka Rin (Doll Profile #1) – How Do You Figure? 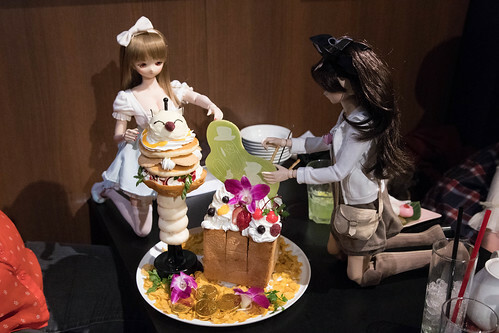 Fast forward a few months to the announcements for DollPa 21. 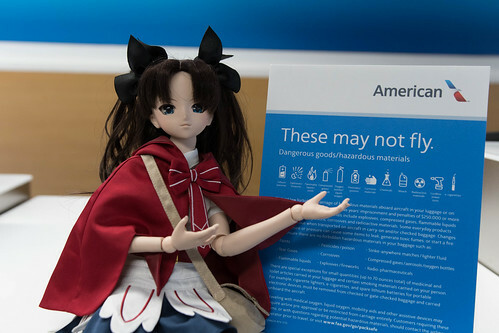 They were planning on making Tohsaka Rin into a doll! 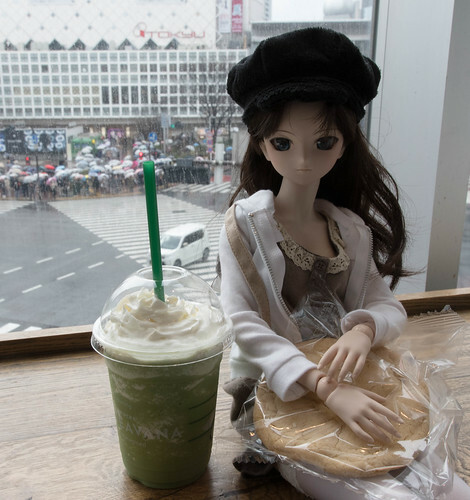 Best of all, she would come in at an affordable ¥48,000 (Under $600 at the exchange then). At that price, I could easily justify having one, it is well under the $1000 of the Saber I saw! Plus, Rin was one of my favorite characters in the Fate franchise, so I decided I’d go for it. 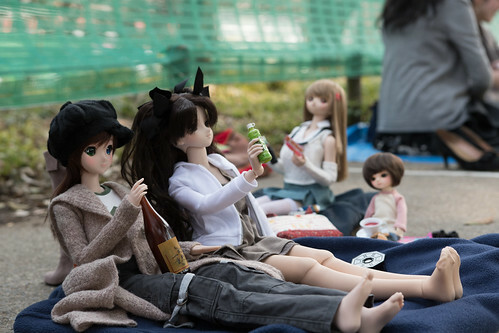 I had a lot to learn about buying from Volks, from the complicated lottery system to the various places you can enter. 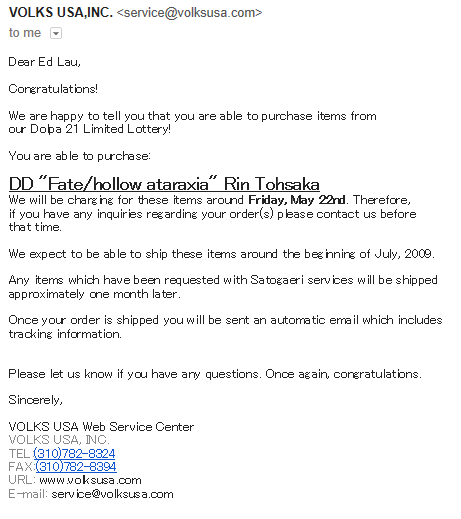 Since I hadn’t figured out the Japanese site at the time, I entered the lottery with Volks USA on May 5, 2009. Ten days later, on May 15, I got the news: I had “won” the ability to spend money. Rin shipped on June 29 and arrived on my doorstep on July 3. At the time, I had no idea what I had started. All I knew was that I had no idea what to do with a doll and how to put one together. It took me several hours to figure out how to dress her. In fact, I had written about the experience of unboxing and putting her together on this very blog! Since then, I’ve done plenty of photoshoots with Rin. 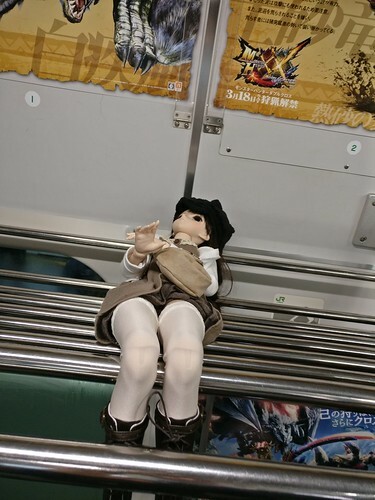 She went to doll meets, dressed in various outfits, and traveled with me on vacation. Then in 2017, Rin took the ultimate trip: she went to Japan with me. I dressed her in some travel clothes, loaded her in a carryon bag, and we went to Tokyo. She contributed to the ultimate experience on that trip, landing us a 1 minute piece on the popular Tokyo Morning show Zip! where a piece produced featured foreigners visiting for Hanami. It turned into something pretty epic, with the TV crew asking us questions, filming us taking pictures, and even publishing some of my photos on Japanese Television! Really, I couldn’t have made this one up, nor imagined in a million years that this would happen. 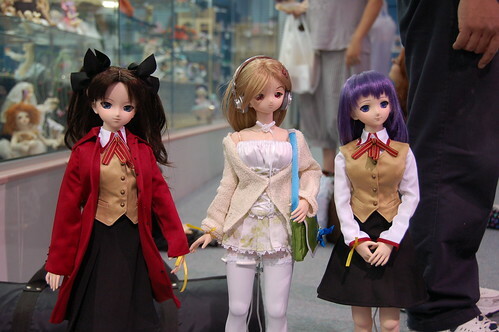 When I first got Rin in 2009, I never thought I would be sitting here nearly almost 10 years (and 20+ dolls later) still in the hobby. I’ve traveled the world, sharpened my photography skills, met lots of great people, and most importantly formed lots of lifelong friendships all because of Rin.